The future's so bright - you gotta wear shades! Come dressed loud and big in your favorite 80's style! Check back closer to race day! We must process Race Day Sign in/Packet Pick Up at a given pace on race day morning. We host a Packet Pick Up before race day and strongly encourage you to take this opportunity to avoid long lines the morning of the race. We will also be taking last minute registrations in person! Please bring your confirmation email and/or registration ID number to early packet pick up. If you plan to pick up a packet for someone else, please have a copy of their confirmation email and/or registration ID. For more information on what each entry includes, click here. ​Register by 11:59 p.m. CST, October 1st to receive a guaranteed CleftStrong 5k race shirt with your registration! This is an option for those who are not able to make it on race day. Virtual Racers may choose to register to complete the 5k from their treadmill, local neighborhood, beach, park, school track, etc. 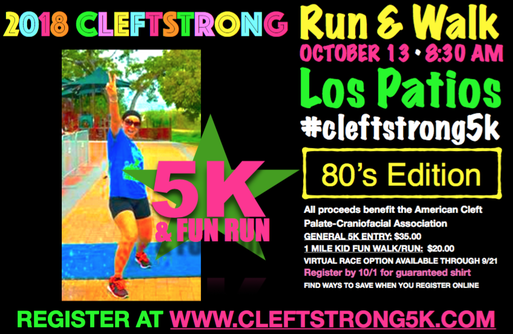 CleftStrong 5k virtual race experiences can be shared at #cleftstrong5k. A race packet is mailed to the address listed at registration. ​You will receive a unique link with your online registration confirmation email once you register. Pass this link on to your friends to use at online registration and for every person that signs up using the unique link you provide them, you will be reimbursed a portion of your registration fee back. • Click on the facebook icon at the end of online registration to share with friends and save! • Learn about other special offers that run through online registration when you subscribe for monthly event updates/reminders here. ​* Unfortunately, we are not able to guarantee a race day shirt in your size after this deadline. * We will be taking last minute registrations in person at early packet pick up (time and place TBA). * Race Day registration opens at 7:30 a.m on race morning. If you pre-registered for the race online, please look for the PACKET PICK UP sign to check in and receive your race packet. Race day check in opens at 7:30 a.m. for pre-registrants unable to make early packet pick up. 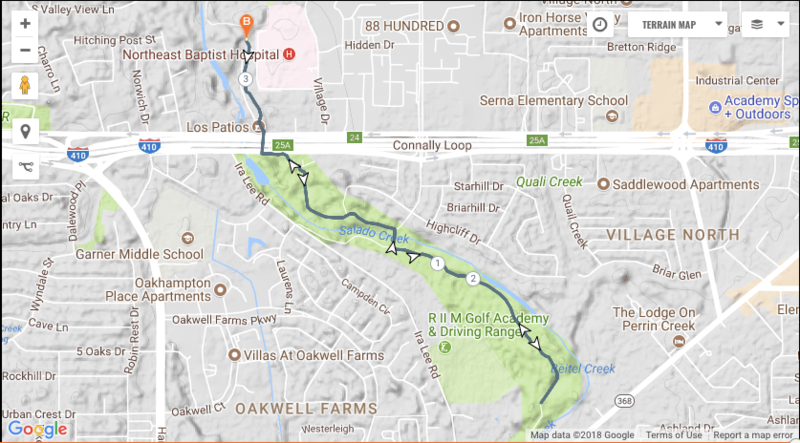 Because we must process Race Day Sign in/Packet Pick Up at a given pace on race day morning, we strongly encourage an early arrival to secure parking and complete the check in process. Please note lines will form according to the first letter of last names. If you did not pre-register online, you may register the morning of the race. Look for the sign that says REGISTER HERE. Race Day registration opens at 7:30 a.m. Because we must process Race Day Registration at a given pace on race morning, we strongly encourage an early arrival to secure parking and complete the registration process. Share your photos with us all along the way with #cleftstrong5k!